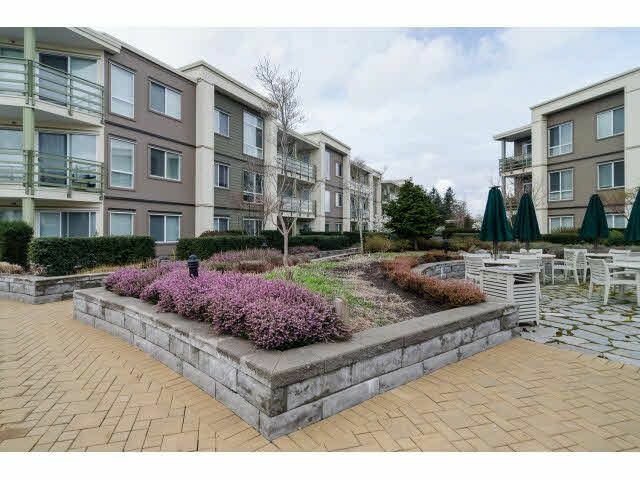 THE SUMMIT HOUSE in the Morgan Crossing - the hub of urban living in South Surrey - hosts this immaculate 2 Bedroom/2 Full Bath TOP FLOOR unit overlooking the gorgeous PRIVATE ONE ACRE PRIVATE ROOFTOP GARDEN with fire pits, BBQ area, walkin g paths, etc! Boasting 10' ceilings; quartz countertops thoughout; Gas top stove; Stainless Steel kitchen appls. ; 888 sq ft with wider balcony deck; insuite laundry; 2 PARKING; 2 pets allowed & Rentals Allowed; PLUS Gas & Hot Water Included in maint fees! Live in the action of the village urban living but own your own peaceful & private residence.